I started racing in 1971 and thought at that time I was a good driver !! How wrong I was. In my first race I crashed after only 3 corners!! Only then I realised that there was more to this racing game than driving fast on the public roads. Late in 1974 I bought a space framed Imp from Eric Paterson for £250, which was previously built and raced by Brain Coyle (he was co-driver to Andrew Cowan London to Sydney Marathon Rally winner). At that time I was married with a kid on the way - £250 was all my savings at the time!!! I first raced this car at Croft and very quickly realised why it was so cheap: it was un-driveable!!! On returning home a bit despondent to say the least, I discovered that the steering geometry was all wrong. The Ackerman on the steering had the outside wheel scribing a tighter angle than the inside wheel !!! So what was happening when cornering? As you turned into a corner the inside would lift as Imps do. However, as soon as it lifted, the outside wheel would take over the steering and as it was actually scribing a tighter angle, it had the same effect as suddenly putting more lock on and would immediately spin!!!! The solution was simple and only cost about £1: I made brackets, welded them to the front uprights altering the Ackerman to give the correct geometry when cornering. 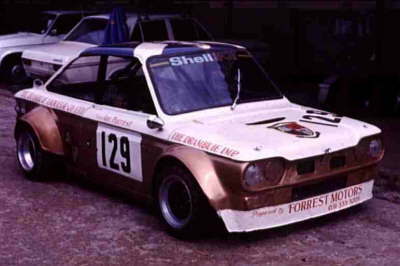 This transformed the Imp and in 1975 went on to win the Lombard Scottish Saloon Car Championship outright and the Knockhill Dart Saloon Car Championship outright, the car was fantastic. My father approached Drambuie (who were based in my home village Kirkliston) for sponsorship that year, and The Drambuie Imp was born. 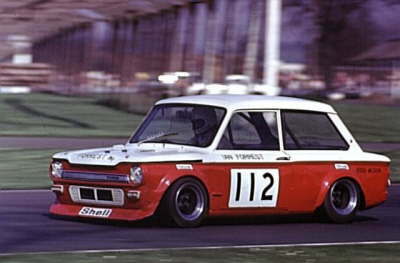 The winner of the Lombard Scottish Saloon Car Championship in 1976 was Ian Forrest in his Imp Californian. He bought the car in 1974 from Eric Patterson, who in turn had bought it from Eric Coyle. Ian got it cheaply, because there were some basic things wrong with the steering and suspension. With his usual flair for spotting a problem and devising an answer, he managed to correct matters for about two bob (10 pence). 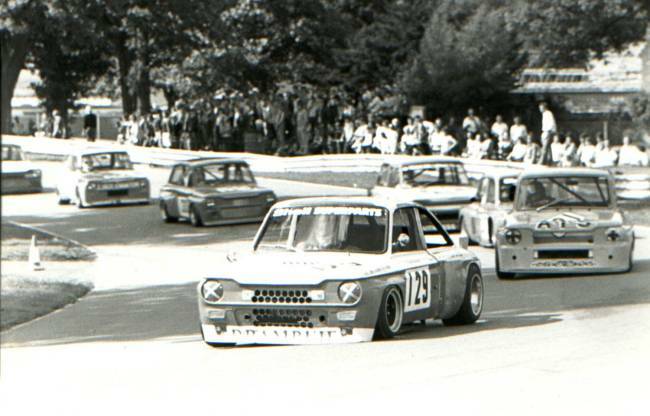 He had reasonable success with the car and in 1975 took the championship, retaining it in 1976. The car has a full race Andy Chesman Imp engine which, during winter, Ian has turned round to improve the weight distribution. One of the side effects is that the gear lever is now on the right hand side for the Formula 3 five speed box. In the engine he has a Greetham GE3 camshaft, Chesman angled head, polished rods, a tuftrided crank, a modified oil pick-up and, as the engine has been raised to the vertical, a short sump. The usual Imp angled sump would scrape along the ground, so he has fitted a special one, which was originally a Chesman experimental unit. So far the experiment seems to be working. The wheelbase is two inches greater than the standard car, making it seven feet. All suspension is as an Elden Formula Ford, The reason for all this innovation and hard work is that last year Ian lost his overall Saloon Car championship title, so is eager to gain revenge. One advantage he has over many is that after winning the 1975 title his father approached Drambuie, the liquer makers (it's good, I can vouch) and they agreed to sponsor Ian. This year their contribution doubled, making the chances of retrieving the title a possibility. When I asked him if he would go to single seaters he replied: "I would like to have a shot, but I think that after driving a Special Saloon like mine, Formula Ford would be a retrograde step, because they don't have slicks and the suchlike. You are driving something that is not going to handle as well. That leaves F3, but the cost and the travelling is prohibitive if you have to run a business as well." Ian Forrest recorded the fastest-ever time at Ingliston for any Imp: the time of 49.2 was a qualifying time not an actual race lap and he believes it was in 1986. Rob Knox has an ex-Drambuie Imp and Brian Cutting's old car, he races at Lydden now and again. Watching the Drambuie Imp and others made me want one, I got one when I was 23, I think! 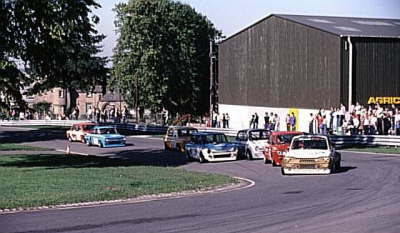 There was word that Ian was in line to buy back one of the Drambuie cars to race, funny thing is my car was about 2 secs a lap quicker than Ian's old record. Ian Forrest with his Drambuie Imp stands out in my mind as fastest under 2 litre. John Brigden looks at four of the best drivers and cars in Scotland. A quarter of p.48-49 is on Ian Forrest. Douglas Jardine writes: "I may be wrong, but if you turn it over I think its one of mine. If you can could you confirm this and if it is so give me a credit [...]"
"It was the second one taken, if it is mine, about 30 years ago at caravan corner at Ingliston." Ian Forrest stays ahead of David Ogilvy, Jim McGauchay, Duncan Fisher, Bill Thompson, Ricky Gauld and Roy Knowles, all in Imp variants! Apparently there is one Ian Forrest, chief instructor at Knockhill circuit in Fife. Mark Evans - His experience of learning to drive a car on a circuit has made a big difference to his enjoyment of the 996. When I got the Porsche, I felt very confident because Id had the opportunity to make my mistakes on the track, he says, before revealing that Ian Forrest, the chief instructor at Knockhill circuit in Fife, keeps a fork about his person to ensure his pupils really get the point. I learned simple things like getting all my braking done in a straight line, and when it gets wet those lessons do come into your mind. The fork-wielding Mr Forrest would be proud. 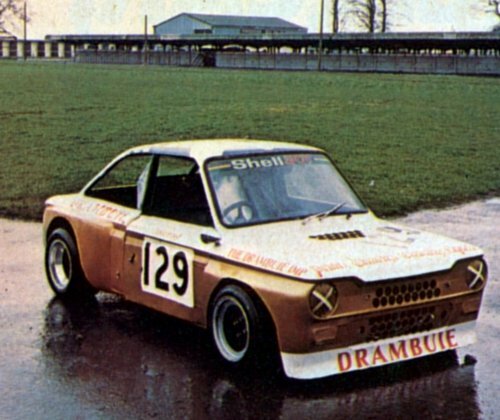 That's Ian Forest's old Drambuie Imp. I remember watching him racing that at Ingliston, where that pic was taken. Years later I was to have the pleasure of having him instruct me in how to conduct a 300 bhp 2 litre turbocharged Sierra Cosworth around Knockhill, which has now assumed the mantle of Scotland's national motorsport venue following the closure of the Ingliston circuit.